On a given day, how much time do your students spend working on their fluency? At the elementary level, hours are devoted to reading and speaking fluency. In middle and high school, students read aloud, deliver oral presentations, and write in a variety of formats to improve upon their language fluency. And yet, while we devote a significant portion of every school day to a student's reading, writing and language fluency, how much time is devoted to the development of their technology fluency? When defining the concept of fluency, we first look at "speed, accuracy, ease and comprehension" (@shfarnsworth). A student who reads with fluency uses inflection, demonstrates appropriate pacing and accurately decodes content. Similarly, a student with technology fluency navigates programs or apps quickly, completing tasks correctly and deliberately. In school, we consider a student fluent when they read and speak the language as well as write it. With technology fluency, a student not only navigates within a single environment, but also begins to "demonstrate an ability to make effective choices and use the tools to advance their understanding and communication" (@toddacurtis). Not only can a truly fluent student speak, listen, write and comprehend, but he or she can also make inferences and construct new meaning. Likewise, the ultimate sign of technology fluency is the "ability to manipulate, transform and move information across various media and platforms" (@ShawnMcCusker). As I'm writing this, it is Computer Science Education Week. Schools across the country have embraced the Hour of Code initiative, but can a student be fluent without knowing how to code? In graduate school, I took courses in HTML and Flash. I can't remember the last time I wrote a web site in straight HTML, nor do I remember object-oriented programming. However, I understand the development process, the iterative cycle, and enough to troubleshoot a variety of other programming languages. While I certainly do not have any mastery of the mechanics of coding, I do have enough fluency to work with speed, ease and accuracy; to make effective choices; and to manipulate information across various media and platforms. For schools that do make the choice to introduce coding, does it necessarily lead to fluency? 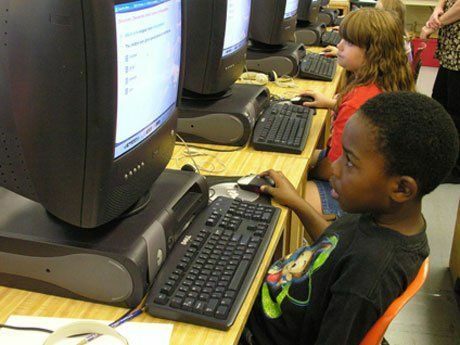 A non-fluent student may be proficient in a single program or app, but not automatically see the connections to other content areas or different contexts. This student might be an expert in the mechanics of Garageband or Audacity, but might not see the connections to moviemaking or podcasting. While it is possible to acquire a specific set of skills from tutorials and checklists, this could lead to a compartmentalized understanding of procedures. How can we help our students develop fluency so that they can construct new objects beyond what was outlined in the directions and learn how to become true digital learners? When you ask students to independently acquire content knowledge via video, audio or text, they have to take ownership of their learning process. I realized this while teaching in a computer lab. Using whole-class, direct instruction to introduce new skills or processes made it too easy for my students. Instead of thinking about the process, they simply waited for my next set of instructions. To challenge even my youngest students, I started posting a screencast or detailed set of directions on my class blog, and then asking them to apply those resources in order to solve a related problem. This allowed me to provide additional support to struggling students, enrich others, and build a reference library for later use, as well as to help my students learn how to learn. If my students needed to complete a multi-step process, I provided only partial instruction -- either in person or via my blog. These steps gave them enough scaffolding to get started and then teach themselves how to finish the project. While I did have the occasional mutiny and group protest for "the answer," most of the time my students would collaborate among themselves to navigate the rest of the challenge. By not providing students with specific steps, they learned to read menu items, access help, search for tutorials and become effective problem solvers, taking critical steps towards fluency. Technology fluency transcends devices, apps and programs. It implies that a student can quickly, accurately and deliberately communicate, collaborate and create across platforms. In Thomas Friedman's book The World is Flat, he made it abundantly clear that we are currently preparing students for jobs that do not yet exist. If we think about it, they will also need to employ technology that has not yet been created. By supporting the development of students' technology fluency, we are preparing them to become digital learners who are able to construct new tools and objects, communicate ideas and solve new problems.